The G-20 Summit held in Pittsburgh on September 24-25 ended with a comprehensive review of the global financial crisis. The summit brought together leaders from industrialized and emerging market economies that account for 80 percent of the global economic output. In the statement issued at the end of the meeting, the G-20 leaders formalized what is already known: that the G-20 will become a mainstay in international diplomacy and global economic leadership. The G-20 became operational in 1999 as a forum for leading industrialized countries in the West and emerging economies to address global economic issues. The G-20 countries include Argentina, Australia, Brazil, Canada, China, France, Germany, India, Indonesia, Italy, Japan, Mexico, Russia, Saudi Arabia, South Africa, South Korea, Turkey, United Kingdom and the United States. It also includes the European Union. The statement from the Pittsburgh summit establishes the G-20 "to be the premier forum for our international economic cooperation." The G-20 for all practical purposes has taken over the role of the G-8 as the premier center of gravity for global economic issues. By effectively coordinating short-term responses to the global economic meltdown during its summits in Washington, DC in 2008 and London in 2009, the G-20 has shown that, at least in the short term, it can work across capitals, regulatory structures and continents to implement broad-based economic policies. By creating the Financial Stability Board, G-20 is sending a strong signal that it can coordinate global efforts to strengthen financial regulations and operations. The G-20 has already begun to mobilize resources to address the global financial crisis. The successful inauguration of the $283 billion International Monetary Fund (I.M.F.) Special Drawing Rights facility to improve availability of funds in all countries, as agreed upon at the London summit in April, strengthened the hand of the G-20. Reportedly, developing and emerging countries have drawn down $100 billion from the facility. Almost $18 billion of the drawn-down funds has reportedly gone to poor countries. In addition, the G-20 successfully boosted I.M.F. resources by $500 billion as part of "a renewed and expanded I.M.F. New Arrangements to Borrow" facility to support poor countries. G-20 finance ministers and central bank governors have so far managed successfully a coordinated plan to inject nearly $5 trillion stimulus funds into the global economy. Within the G-20, the so-called BRIC countries (Brazil, Russia, India and China) have become indispensable global economic players. The cooperation of each BRIC country will be crucial to the future success of G-20 as Western industrialized countries remain on track to record anemic growth for the next few years. Today, it is unthinkable to discuss global economic issues without the active participation of China. Since nature abhors a vacuum, the emergency of G-20 as the centerpiece of the global economy has created major responsibilities. As the economy continues a sluggish recovery, the G-20 faces multiple litmus tests of responsibility. A) The creation and sustenance of a new transparent, comprehensive global financial operational and regulatory system. The envisaged system, borrowing heavily from lessons learned in managing the worst economic meltdown since the 1930's will likely address issues of transparency and accountability in financial transactions; enforce the need to raise adequate cash reserves by financial institutions that engage in high-stakes risk taking, averting the need for tax payer bailouts; implement accounting standards across multiple jurisdictions and regulatory environments; end profligate executive compensation for senior managers; implement enhanced oversight of the over-the-counter derivatives markets and other forms of debt-leveraged transactions; complete regulatory reforms in most countries as the backbone of a revamped global financial architecture; better supervise the activities of credit rating agencies as part of risk analysis and risk management strategies; and address imbalances in the import and export of goods between nations through a new framework for sustainable, balanced growth. These issues require significant political will in G-20 nations and other countries. Resolution of policy and program issues on a new global financial regulatory system may become bogged down in domestic political disputes. B) Reforming the I.M.F. and the World Bank. The G-20 remains committed to reforms in both institutions. Reforms will focus on increasing the role of emerging and developing economies in the decision making process; ending the understanding that an American will head the World Bank and a European will run the I.M.F. ; expanding the role and scope of the I.M.F. as the "lender of last resort;" and realigning the operations of the World Bank to better meet the needs of the poor worldwide. C) Completing the Doha Round talks. G-20 at the April summit committed to the completion of World Trade Organization Doha Round talks by 2010. Rich nations, emerging economies and poor nations are yet to resolve their differences on the way forward. By adopting a firm stand against trade protectionism, G-20 leaders hope to persuade all parties to reach a deal on enhanced international trade. D) Reaching agreement on climate change. The Pittsburgh summit statement strongly supports efforts to combat climate change. A short-term goal is to reach a global agreement on combating climate change at the Copenhagen summit in December. The medium-term goal is to phase out "inefficient fuel subsidies while providing targeted support for the poorest." A long-term goal is to cut global greenhouse gas emissions. E) Dealing with the plight of the poor worldwide. The G-20 is now broadly responsible for leading global efforts against poverty. As noted in the summit statement, more than 4 billion individuals are "undereducated, ill-equipped with capital and technology, and insufficiently integrated into the global economy." According to recent reports by the World Bank and the United Nations, more than 89 million people will be living on less than $1.25 a day by the end of 2010 as a direct result of the global economic crisis. At least $11.6 billion in spending on healthcare, education, social welfare programs and infrastructure projects for the poor is also at risk. Hunger rates are up in every region of the world. The G-20 faces the gargantuan task of designing broad, effective strategies on poverty alleviation during the next two summits in 2010. The G-20 is likely to focus on a combination of strategies. These strategies will likely include accelerated reforms at I.M.F. and the World Bank; promoting small- and medium-scale enterprises to counter a potential jobless economic recovery; and adopting policies and programs that create wealth for the poor rather than merely alleviate poverty. 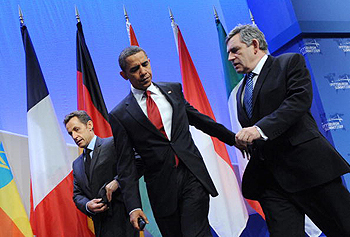 The G-20 has now taken center stage in international diplomacy and the task of shepherding global economic recovery. It has shown the capacity to achieve short-term results by coordinating a robust global response to the recent economic crisis. The G-20, using its new clout, must now move to address international development issues made worse by the economic meltdown. Time will tell if G-20 represents a 21st Century paradigm shift on how the international community responds to global problems and concerns.